I am so pleased to say that we have finally moved into our new place! It is out of the city center and right next to the lake in a lovely area called Rotherbaum (Red Tree in German). After living in city centers for many years now I forgot what it’s like to only hear the trees blowing at night. So after many weeks of slowly unpacking and a few trips to IKEA we finally able to enjoy a meal at our dining room table. Weekend breakfast being my favorite, consist of a brightly colored fresh fruit salad. But in my new, double the size kitchen I have the counter space to be more creative. So here are 2 versions of a twist on the normal fruit salad, Breakfast Bananas in: Berry flavor with Raspberries, Pecans and Lemon Cream; and Tropical flavor with Mango, Macadamia Nuts and Coconut Cream. For presentation purposes I made a half recipe of both for the photo above. Serve it with Spiced Agave on the side and drizzle right before you eat. Enjoy these for breakfast, dessert or make the cream and agave in advance and take it to work for the afternoon sweet tooth cravings! Slice the bananas lengthwise and set on a plate with the flat/ cut side up. 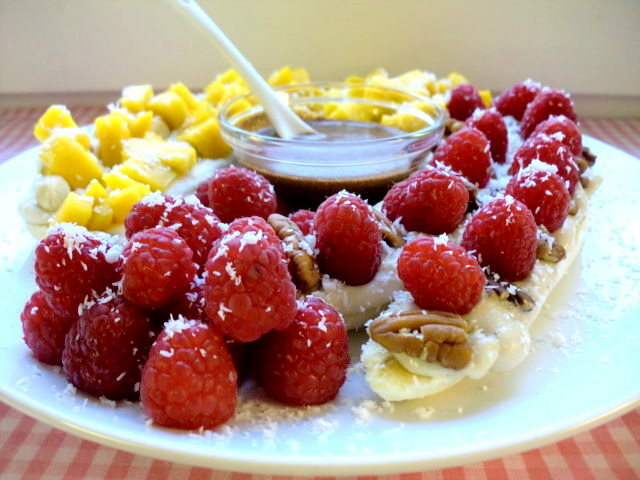 Spoon the cream over the bananas and top with fruit and nuts. Sprinkle with coconut and serve with the left over fruit and agave, allowing your guests to drizzle themselves. Blend 8 tbls of dried coconut with the water for 30 seconds. Strain through a nut seed bag or mesh metal sieve to produce 3 1/2 – 4 tbls of Coconut Milk. Blend 3 tbls Coconut Milk with the rest of the ingredients in a Magic Bullet using the flat blade or blender until completely smooth. In a small bowl, shift in spices over the agave nectar being sure to stir continually to prevent lumps. This entry was posted on November 14, 2010 by Olive. It was filed under Uncategorized . Congrats on your new place! This looks so fabulous! Yum!!! Yes – this would be my perfect breakfast! Yummm…I want to pop right over for this wonderful looking breakfast! So happy you have a new place with twice the space! I don’t know how you’d get more creative, but I am seeing that with you, anything is possible! Great post baby…please make it for me for my next visit. Congrats on the new place! Coconut cream = heaven! Love it! She returns! And with such flair! Both flavors are lovely and perfect for a morning boost. Post this on FB, por favor. Does Olive have her own room now? Oh my this is going to be what you make me for xmas breakfast. Great to think we’re going to be together in a short time. Oh so glad I found your blog! I love raw food but don’t go out of my way to make it. I do make my own nut butters and have made almond milk. The coconut cream sounds so delectable yet healthy! I”ll have to use coconut milk cause I don’t have a coconut (excuse to go buy one? ha). I have been craving this breakfast since I saw the recipe a few months back! I have promised myself to make it during this coming week 🙂 Finaly!